38 • RV PRO • November 2018 rv-pro.com O P E N H O U S E C O V E R A G E Winnebago Micro Minnie 2405 Fifth Wheel Winnebago Towables reports finding good success with its 7-foot-wide Micro Minnie trailer line, which debuted in 2014. So, how to capitalize and build on that? 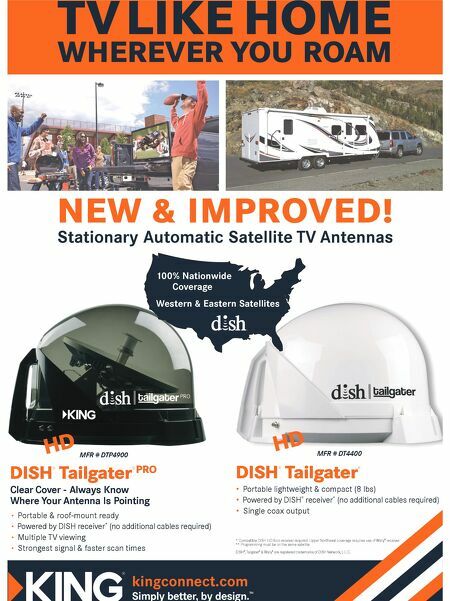 The RV manufacturer revealed its answer during Open House Week, when it showcased the new Micro Minnie fifth wheel lineup, which will consist of five floorplans. RV PRO toured the 26-foot, 9-inch 2405RG model. The Micro Minnie fiver has a dry weight of just under 5,800 pounds, making it easily towable by midsized trucks, such as the Chevy Colorado, Ford Ranger and Toyota Tacoma. Sam Jefson, company public relations specialist, notes in compar- ison that many other fifth wheels that describe themselves as half-ton towable weigh 7,000, 8,000 or even 9,000 pounds. The Micro Minnie fifth wheel features solid construction with an aluminum frame and true gel-coat fiberglass sidewalls. Notable exterior features include plenty of large windows, an 18-foot awning with LED lighting and LCI Solid Steps entry steps. Notable features in the rear galley coach include a Dometic refrigerator/ freezer, a flush-mount three-burner cooktop with glass cover, a microwave, solid-surface countertops, and a stain- less-steel sink. The bathroom is located mid-coach and the bedroom, complete with queen-sized bed, is located at the front of the fifth wheel. The fifth wheel features a 6-gallon DSI/ gas/ electric water heater and an 18,000-BTU furnace. The Micro Minnie offers fresh water capacity of 31 gallons; a gray tank capacity of 50 gallons; and a black water tank capacity of 25 gallons. The LP capacity is 60 gallons. For an RV of its size, the Micro Minnie fiver has a good amount of storage space. The MSRP for the Micro Minnie fifth wheel is about $30,000. What impressed RV PRO: The only thing "micro" about the Micro Minnie fifth wheel is the name; the fiver is light on weight but still manages to come nicely equipped. And thanks in part to its large windows, use of light interior colors and its well-conceived layout, the 7-foot-wide Micro Minnie doesn't feel cramped. 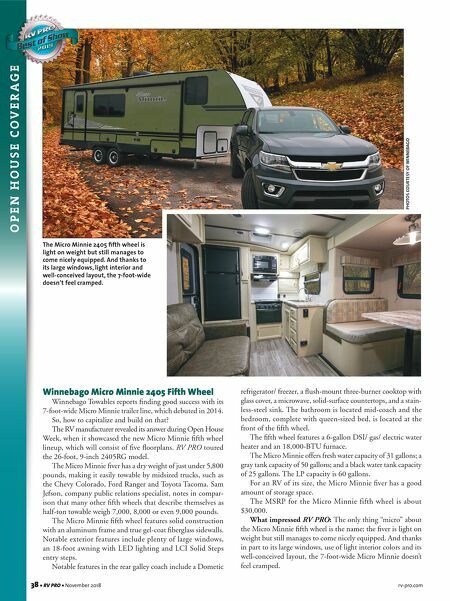 PHOTOS COURTESY OF WINNEBAGO The Micro Minnie 2405 fifth wheel is light on weight but still manages to come nicely equipped. And thanks to its large windows, light interior and well-conceived layout, the 7-foot-wide doesn't feel cramped.